The 52nd Pleasanton Young Farmers Cowboy of the Year Open Rodeo Festival opened with the annual ceremony to recognize deserving cowboys. Amid rodeo fans and family, three men were honored before the Friday evening event. Mark Kennerly joined 51 other cowboys before him as the newest member of Atascosa County Working Cowboy of the Year. Two men were also inducted into the South Texas Cowboy Hall of Fame posthumously. Juan N. Pacheco and Avant Burmeister “Meister” Coward. Robbie Hamby | Pleasanton Express Mark Kennerly (receiving award from Cowboy Selection committee member Darryl Ashley) was named the 2017 Atascosa County Working Cowboy of the Year before the Pleasanton Young Farmers Cowboy of the Year Open Rodeo. He was presented a hand tooled saddle from Gus Wheeler (right) of Atascosa Livestock Exchange. Sue Brown (from left) editor of Pleasanton Express, served as emceee and Brad Mumm, Pleasanton Chamber of Commerce and Jessica Bomar Wier 2nd Vice President presented a vest. People have always been fascinated with the cowboy life style, but it’s much more than a ten gallon hat and custom boots. Growing up in the South Texas Brush Country this man knew at a young age his passion was in cowboying. Being the third born child in a family of seven children his parents were very pleased to let him and his pony Star load up with local cowboy, Mr. Wiley Seago, to help him work and doctor cattle at the young age of 8. It was then that he began to absorb the skills he would use for the rest of his life. Throughout his teenage years he continued to work for various cowboys on ranches as well as prove his individual skills and abilities in the rodeo arena. From 1972-74 he worked under Alvin Streadl at the Lundells Headquarters. It was there that he spent numerous hours assisting Mr. Streadl with maintaining 15,000 acres of ranch land, tending to 900 momma cows and caring for registered Santa Gertrudis Cattle. After graduation from Alice High School he attended A&I University and then went on to graduate from North Texas Horseshoeing Institute in Grapevine. From 1976-1980 he traveled around South Texas shoeing horses. In 1980, he got married and spent the next 12 years working for Patterson Rental tools. He also continued to help at local ranches working cattle, shoeing horses and riding colts. While raising his family, he traveled across the state of Texas taking his children to youth rodeos. His passion for cowboying never died and in 1991 he left the rental tool business to follow his dream. For the next 20 years he has been on ranches in the brush country helping preserve the American image of the cowboy. During this time he has worked yearling operations and ran a ranch overseeing the registered Beefmaster herd. 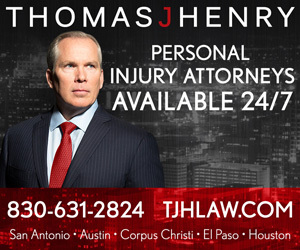 In 2011 he began his current job for Donnell Ranches. Here he is responsible for the cattle operation. He oversees the ranches yearling and cow/calf operation. He spends time riding horseback, checking cattle and working them. This world is changing very quickly with technology, but the cowboy is still needed on South Texas ranches. 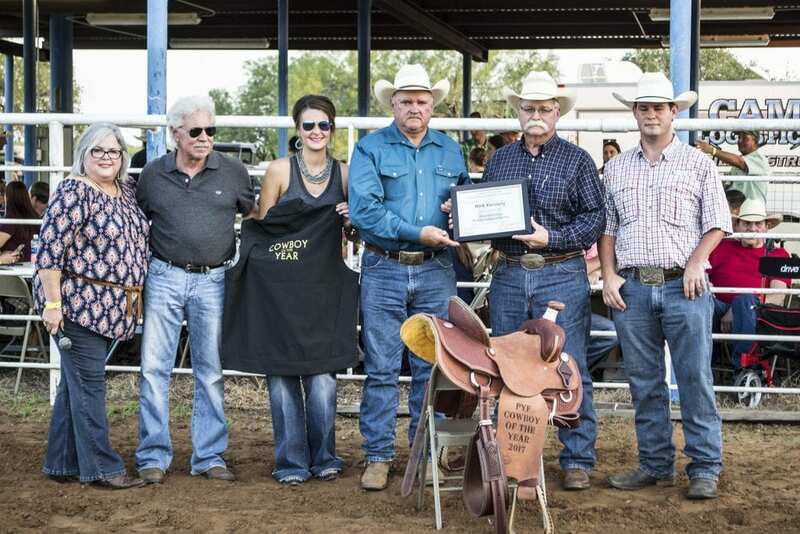 He received a hand-tooled Teskey saddle, which was again generously donated by the Atascosa Livestock Exchange, from Gus Wheeler. His certificate was presented by Cowboy Selection Committee member and former Cowboy of the Year Darryl Ashley. A vest was also presented by the Pleasanton Chamber of Commerce president Brad Mumm and 2nd vice president Jessica Wier. Juan N. Pacheco is a gentleman who worked for the Peeler Ranch, Arrow S Ranch and then the 74 Ranch. He was a very good all-around cowboy. He could ride, rope, work cattle, break horses and he did anything else that came along with ranch duties. He was a true cowboy and never complained. When he wasn’t working at the ranch, he was breaking horses for the remuda. He did this even after retiring. Juan’s father passed his skills to him and he passed it to his boys, and they passed the same to their boys. There aren’t very many cowboys like him anymore – they are what we may call a dying breed. Mr. Pacheco passed away in 2015 and his family accepted the certificate. A portion of his nomination letter follows. My father was the youngest of 12 boys – born August 22, 1905 in Atascosa County and spent his whole life here. Being a cowboy was a way of life. He was in the saddle from a young age and had a lot of help in learning how to handle cattle from his parents and brothers. He also participated in rodeos. He was an extra in the movie about Teddy Roosevelt called “Rough Riders” in 1926. He continued to be in ranching all of his life until his death in the line of duty as an Atascosa County Deputy Sheriff on August 2, 1952. After the presentations, the rodeo followed. Following the rodeo, Nick Lawrence entertained the crowd. Each year a committee of former Cowboys of the Year help select the winners. The Pleasanton Express acted as roundup headquarters where a group of 17 former Cowboys of the Year attended. On Saturday, the barbecue cook-off drew 24 teams and there were 14 washer tourney teams. Those results will be in the August 30 issue. Rick Treviño was the headliner for Saturday evening’s dance and drew a great crowd.